I must have been meant to read the book Following Atticus. I write about adventurous small dogs all of the time so it immediately called out to me from the bookstore table when I saw it. Then I won a copy from Life with Dogs. I managed to devour the book in two days…which says a lot if the two years worth of books stacking up on my table is any indication. 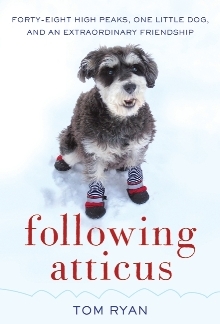 The story of Atticus was inspiring and reminded me about how ingrained the stereotype of small dogs is – of how they are underestimated in our society. Atticus weighs under 20 lbs and he managed to accomplish what few men (and only one big dog) ever have – climbing to all 48 of New Hampshire’s Four-thousand footers (mountain peaks)…..in winter! In the story, Atticus and Tom encounter several people who are in disbelief about a small dog hiking to the top of a mountain. For example, they sure shocked a bunch of guys who “conquered” the summit of Mt. Washington. The men were decked out in full climbing gear and were horrified to find a small dog had beat them to the top! They just stared and then one guy asked “You and that little dog just walked up HERE?” in utter disbelief. Just like in the book, many people think “You can’t take that dog up the mountain. He is too small”. We are here to prove those people wrong. 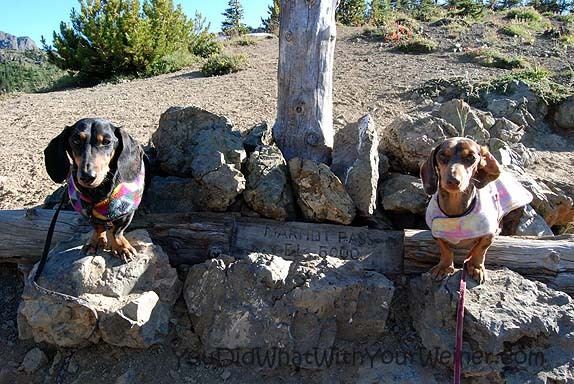 We regularly complete hikes with our miniature Dachshunds Chester and Gretel that are up to 15 miles, have elevations gains averaging 3,000+ feet and are over four-thousand feet at the top. We don’t let snow stop us from enjoying some of our favorite summer hikes either. On our hikes, they have no problems scrambling up rocks. They really are all terrain doggies. We hope that the story of little Atticus is able to do what we haven’t yet – hit it big enough to grab the attention of the nation. We are glad to see this story get so much coverage and help break through the small dog stereotypes. We would love to start seeing more small dogs out on the trail. I love this book so much that I wish I had a copy to give you (no, you can’t have mine. Ha, ha). If you want a chance or two to win a copy for yourself, please visit our friends over at the Pet Travel Book Club. I go practically everywhere (except downhill skiing – still think I could do that one!) they go! I hike, fish, camp…many people are surprised. Mom says little dogs can do anything. I go where my people go. i love ’em that much. We believe little dogs can do anything too 🙂 Unfortunately, Chester and Gretel don’t GET to do everything because they can’t be off leash. They won’t come back. Ha, ha. So, unfortunately, I think snowboarding with us would be out of the question. You guys are great adventurers – I can’t imagine anything getting in your way!! It’s true – great things can come in small packages and you guys prove this – enjoy your adventures buddies!! Couldn’t have said it better myself! We love having a partner in crime half-way across the country 🙂 Go little Leeloo, Go! I really enjoyed it. It’s a quick read too. Oh I saw him on Dogs 101! He’s so inspiring, and quite handsome (blush). I did a post about small dog stereotypes last night! That’s awesome we were on the same page with that. I will share your post when I get back to my real computer tonight. How cool that you won the book from Life With Dogs. It must have been like the book was written for you guys! We’ll be looking forward to photos from Mount Baker!